Fishing Michigan's Manistee River, Pere Marquette River, and Muskegon River for Spring Steelhead. Spring "Steelhead Season" in Michigan starts in March and can last well into May on several rivers in Michigan. Northwest Michigan offers some of the best spring runs of steelhead in the Midwest. The Pere Marquette River is one of the great Michigan steelhead streams and starts seeing good to great steelhead fishing in early March. Located just north of the Pere Marquette river is the Big Manistee River which offers the largest run of Lake Michigan steelhead in northern Michigan. The Pere Marquette is a smaller freestone stream with good numbers of pools and pockets for steelhead to hold in. 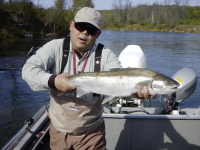 Guided fly fishing for steelhead includes using a drift boat and covering large amounts of water in search of different pools and runs that will produce trout and steelhead on a daily basis. The Big Manistee River is a much larger tailwater controlled environment. The use of a drift boat or a jet sled is used while guiding this river. Early in the season, the use of wiggler or Hex patterns (Hexagenia nymph) are used in conjunction with an egg pattern and the same with small early black stonefly nymphs. Water temperatures on the Pere Marquette River will range wildly with sunny days and rapid snow melts from spring showers. Hatches of small stones can trigger a bite from trout and steelhead. The use of caddis and mayfly nymphs also works well as the water levels and temperatures start to climb with warmer weather. The Big Manistee River is controlled by Tippy Dam and the water takes longer to warm than smaller rivers. When the water does start to warm in April, it is hard to beat a day of guided fishing on the Manistee river. The Manistee River starts to see great numbers of steelhead working towards the dam area (upstream limit) and the fly fishing for spring steelhead is red hot! The middle of April starts major runs of steelhead on the Muskegon River located in Newaygo, Michigan. The water below Croton Dam is a tailwater fishery. The use of a jet sled while guiding the Muskegon for steelhead allows the anglers to cover vast amounts of river and offers some of the best steelhead fishing in the world. The use of egg patterns and nymph patterns work well. The Muskegon is a great river to swing flies. A good number of wild fish, mixed with a great number of hatchery steelhead, means great fishing by all! 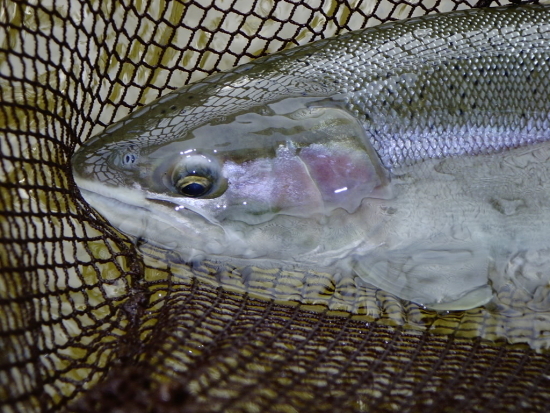 The Muskegon offers great spring steelhead opportunities well into May. Fishing in May can produce days of great fly fishing for steelhead and the weather can be warm enough to be in a t-shirt on many days. With dryer weather and more sun, smaller patterns of nymphs and eggs are used while guiding the Muskegon River for spring trout and steelhead. The Pere Marquette River has a weir located in Custer, Michigan. The weir is for lamprey control and is a natural barrier for all migratory fish in the spring. Late spring showers always produces a secondary push of spring steelhead on the Pere Marquette River, as well as a good number of drop back or spawned out steelhead heading back to Lake Michigan. These fish can be fished with sinking lines and streamers. The later portions of April and into May provide anglers on a guided spring steelhead trip to catch numbers of browns as well as steelhead while traveling down the river on a trip. Early hatches of caddis and stones produce the first dry fly fishing of the season. Guided spring trout and steelhead fishing is all about timing. Early march can produce great fishing opportunities if the weather is warm and the water is not too high from snow melt. Look for increases in water flow and temperatures to move better numbers of fish into the beautiful runs and pools that Michigan's great rivers provide. Guided spring steelhead fishing on Michigan's Manistee, Muskegon, and Pere Marquette rivers can be enjoyed by all. Guided fishing offers opportunity for the novice angler as well as the pro.